Below is Endure Fly Spray for sale on Amazon. There is usually an excellent selection with sizes ranging from 3-ounce roll-ons to 32-ounce spray bottles to gallons. Below: A 32-ounce bottle of Endure Sweat Resistant Fly Spray For Horses. Here at CowboyWay.com we were frustrated with inexpensive, economy type fly sprays for horses when riding in the pasture. The economy sprays worked for us in the early spring and fall, but during the peak of summer they just didn't perform in the pasture. We became curious and wanted to know if Endure Sweat Resistant Fly Spray would work better for us. So, we tested Endure Sweat Resistant Fly Spray (a premium-priced fly spray) and Pyranha Wipe N Spray (also premium-priced) against two economy-priced fly sprays: GPS Fly-Die and Bronco. 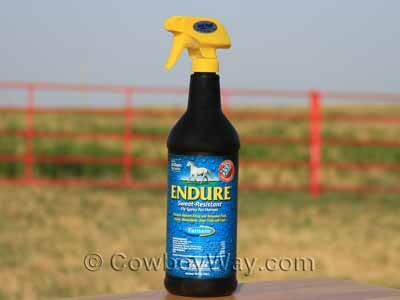 We liked how Endure Sweat-Resistant Fly Spray For Horses performed for us in the pasture. It wasn't perfect - it didn't last anywhere near the 14 days it said it could last up to on the label - but it did perform very well in the pasture for about an hour or sometimes longer, even with a sweaty horse. We also liked how a different brand of fly spray, Pyranha Wipe 'N Spray, performed in the pasture. While both Endure Sweat Resistant fly spray and Pyranha Wipe 'N Spray are premium-priced, Pyranha usually costs slightly less than Endure. So, even though the Endure seemed to have a slight edge in how long it lasted, the edge was so slight that, for the money, we thought the Pyranha Wipe N Spray was a better deal. 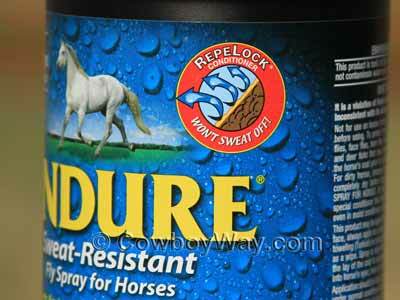 Below: A close-up of a 32-ounce bottle of Endure Sweat Resistant Fly Spray For Horses showing the "RepeLock" logo. 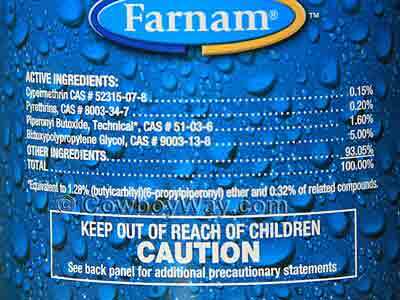 Below: A 32-ounce bottle of Endure Sweat Resistant Fly Spray For Horses showing the ingredients.